The Ring Video Doorbell 2 lets you answer your door from anywhere, whether it's the couch, the office or the beach. Simply open the app to instantly see who rang your video doorbell and communicate with them. A small yet powerful camera that functions well as the first line of defense in your home security setup. The Ring Video Doorbell 2 keeps watch over your front door - by far the most vulnerable part of your home when it comes to break-ins. Of course, the video doorbell hasn't just been designed for security, it's also highly convenient. It allows you to answer your door from anywhere! The smart doorbell is easy to install, with two different installation options letting you adjust the smart doorbell to your pre-existing setup. Stay in the know: Simply tune in to the live stream to keep an eye on your home. What's more, you'll get an instant notification on your mobile or desktop device anytime the video doorbell detects someone at the door. Adjustable motion detection lets you decide how sensitive the camera is. Seriously powerful: Ring Video Doorbell 2 has everything it needs to keep an eye over your home 24/7. The camera delivers footage in 1080p HD, even at night thanks to infrared night vision. A 160-degree field-of-view allows the camera to see virtually everything that's going around the front of your home. Strike up a conversation: The smart doorbell's 2-way intercom allows you and your visitors to communicate with each other in real time. While this allows you to conveniently give instructions to a handyman or mailman when you're not at home, it also allows you to scare off intruders if you think a break-in is happening. Works with your home: You can choose between a hard-wired or battery-powered installation of your new wi-fi doorbell camera. A hard-wired installation involves simply replacing your existing doorbell. Using the doorbell as a battery-powered device allows you to mount it wherever you want it in your home, with recharging being easy thanks to quick-release design. Wide-ranging compatibility: You can download the mobile app on your iOS (iOS 9.1 or later) or Android (Android 5.0 or up) device, as well as access the camera via web app on a Mac or Windows 10 laptop or desktop. The newest version of the video doorbell from Ring works as a great line of first defense in your home security network. It monitors everything that's going around the front door of your home - the most commonly used entry point during a break in. The Ring Video Doorbell 2 also has a built-in 2-way intercom, allowing you to personally intervene if you suspect burglars are attempting to access your home. 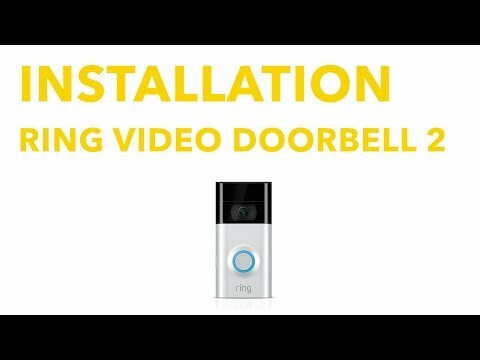 Ring offers a subscription service that gives your video doorbell even more powerful features. It allows the doorbell to automatically store any video clips it records in the cloud for 60 days, where you can review, share and save them. This feature is particularly useful when it comes to home security - you'll gain valuable evidence to give to law enforcement should you experience a break-in. You'll get a free 30-day trial for Ring's subscription service, with no long-term contract being required for those who wish to open a subscription. Also available are two accessories that let you adjust the viewing angle of the smart doorbell. The corner kit allows you to adjust the horizontal viewing able by between 15-30 degrees, allowing for improved motion detection in your walkway or entryway. Meanwhile, the wedge kit is ideal for anyone who wants to install the video doorbell against an angled surface. Everything you need for installation is included at delivery. You can use the written instructions or video instructions available online from Ring. A powerful camera, with 1080p HD and night vision giving you crystal clear footage 24/7. It's resistant against bad weather, while also being able to withstand temperatures well below freezing. A streamlined layout that gives you everything you need at a glance. The app delivers mobile notifications anytime it detects someone in front of or near the camera. A video doorbell that records in 1080p HD, day and night thanks to infrared night vision. Notifies you on your iOS or Android phone when it detects someone in front of the camera. You can customize motion detection sensitivity, allowing you to decide at what range and in which areas the camera monitors for activity. Relies on strength of your Wi-Fi connection for video streaming. Simple look designed to emulate the appearance of a regular doorbell. You can choose from two different skins to suit the device to your door (satin nickel or venetian copper). You can delete footage taken by the camera anytime you like. You also control which users are able to access the live stream on their respective devices. An invaluable investment in your home security - monitor the most vulnerable point of your home in real time. Ability to answer your doorbell from anywhere is also seriously convenient. Can the Ring Video Doorbell 2 also be used without an existing doorbell connection? Yes, the option to power the Ring Video Doorbell 2 using a rechargeable battery allows you to mount it wherever you please. Is it possible to save video footage that the Ring Video Doorbell 2 records? The video doorbell will record any footage it records for the first 30 days. After this, you'll need a subscription plan to continue to store video footage. Can I access the Ring Video Doorbell 2 from multiple devices? Yes, multiple users can access the smart doorbell on their respective phones, tablets, laptops and desktops.